Giving someone financial power of attorney enables that person to perform real estate transactions, bank transactions, business operations, and any other action the principal specifies. 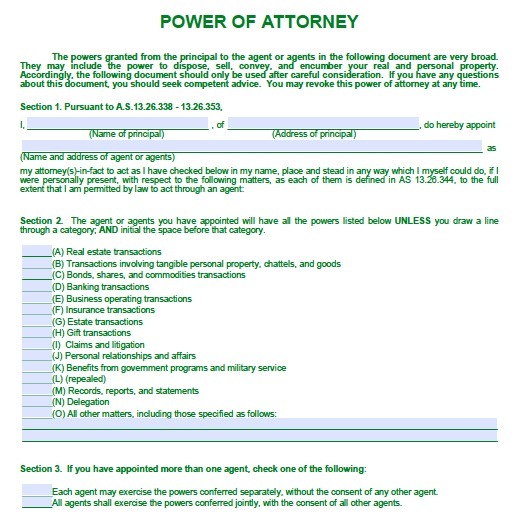 In Alaska, a standard power of attorney form lists these actions, and the principal may select any number of them for the agent to perform. There is also a space where the principal can write in specific matters for the agent to take care of. The standard Alaskan form also features sections where you can specify that the power is durable, meaning that it shall not cease if you become incapacitated and unable to make financial decisions, or you can specify a date for the power of attorney to terminate. This can be a convenient option if you only need an agent to handle financial matters for a short duration.